Women for Election CEO calls for female political candidates | SHEmazing! 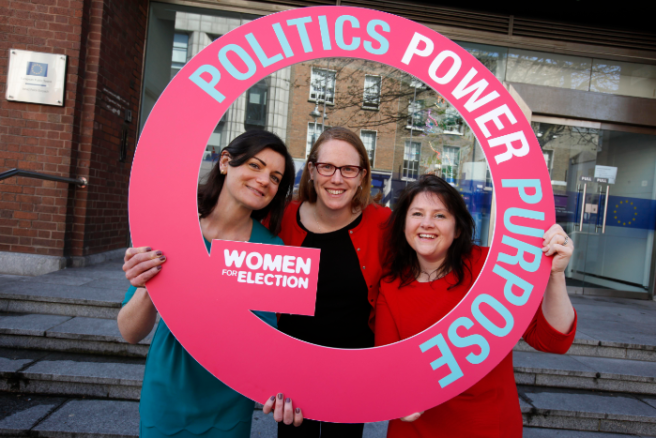 Women for Election CEO Ciairín de Buis has called on women to run in elections this coming May, and for parties to encourage female candidates. The panel was chaired by journalist Alison O'Connor, and included Lisa Chambers TD (Fianna Fáil), TD (Green Party), Senator Alice-Mary Higgins (Independent), Cllr Madeleine Johansson (People Before Profit) and Kate O'Connell TD (Fine Gael). The event asked politicians about the chance of more women running and winning elections this year, and how parties are taking action to help improve gender balances in the political sphere. In our last local elections in 2014, only 21 percent of electives were female councillors, compared to 16 percent in 2009. There has undoubtedly been a swell in political activism in Ireland over the last few years, especially due to the Repeal movement, and the panel were discussing whether this energy would make it to the polls and ballots. Women for Election CEO Ciairín de Buis commented; “2019 has at least two elections, possibly more. Last year we held a series of training events in Dublin, Cork and Galway covering communication strategies, campaigning and canvassing." 22 percent of TDs are women currently, a historic high, but still too low. Green Party leader and TD Eamon Ryan mentions the praise-worthy work of former Green Party TD and former Minister of State Mary White’s role in the establishment of gender quotas for party candidate lists. Fine Gael TD Kate O’Connell refers to the centennial celebration of certain women securing the right to vote, noting that this has added to the conversation around women's role in politics in Ireland. “The celebration of 100 years since some women first achieved the right to vote has focused the mind on our incomplete democracy,” says Deputy O’Connell. “Whilst mindful of the progress we have made in terms of female representation it is still shocking that 78% of those in Dáil Éireann are men. "Leaders must now act by example. The time for acceptance of anything less than an equal male to female ratio is nigh on over." she concluded. Non-for-profit Women for Election will be hosting training throughout 2019 for women, as well as hopefully organising an online course.